What an honor to serve at the Installation Mass of Chicago’s Ninth Archbishop, Blase Cupich and to wish the best to Francis Cardinal George as he begins a much deserved retirement after 17 years. There are so many stories to share! Let me start by saying, I’ve taken the Red Line train to Holy Name Cathedral dozens of times! Tuesday morning, I was so excited/nervous that I got off the train one stop too soon. And I was so exhausted on the way home that I went two extra stops before I realized that it was time to get off! (I’m sure there’s a metaphor in there someplace.) Needless to say, it was a really incredible day! Almost a month ago, I received a phone call from the Office for Divine Worship. They had recently met with Bishop Cupich to discuss the installation ceremonies. Bishop Cupich specifically requested both men and women altar servers at the Installation Mass on November 18. 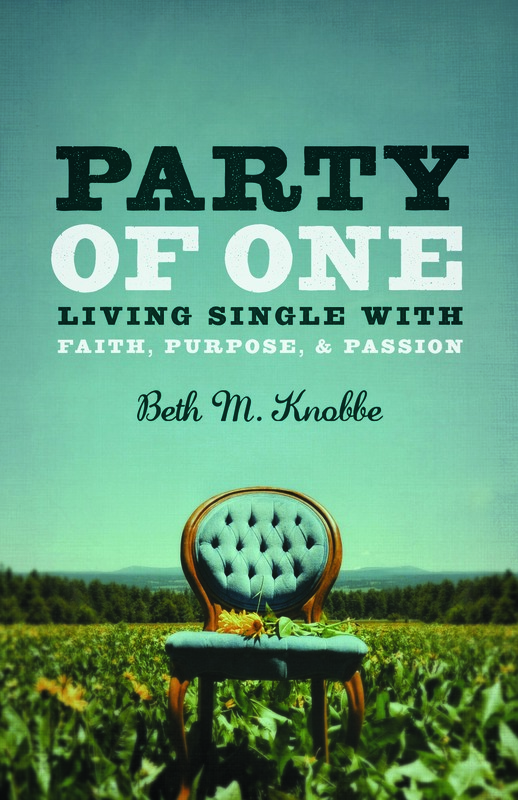 There would be four women and four seminarians represented. Would I be willing and available to serve? The mass was wonderful – beautiful, prayerful, lively, humorous, spirit-filled! You can watch the procession and listen to the homily online. As a matter of fact, I should go back and watch it myself! There was a pillar blocking my view of the Cathedra, so while I could hear everything just fine, I could not see any of the ceremony! It was liturgy with style and grace at its very best! I found myself repeating the refrain of my favorite liturgy professor, “Hold holy objects with reverence and care.” In other words, don’t drop the candle and don’t trip on the stairs! In some ways, the Mass itself was not all that different. And yet, this Mass was incredibly significant! It was one of those grand occasions where I’m tempted to impart meaning on every minor detail. With all the pomp and circumstance, everything seemed so much larger than life. I will try not to embellish too much! On the day the Church installed a new Archbishop, “welcome” was an overriding theme! There was an atmosphere of welcome and inclusion that I hope to hold onto for a long time. To be honest, being welcoming and inclusive is not something that the Church has always done well, and I think we still have a long way to go. There are moments from this day that I will truly treasure. When the altar servers gathered in the sanctuary for rehearsal, instinctively and without prompting, there began a round of introductions. Everyone made sure that names had been shared – Andy, Adam, Beth, Christina, Fr. Matt, Fr. Brad, Juan, Michael, Amanda, and Sarah. As we waited for Mass to begin, the atmosphere in the sacristy was like a gathering of old friends – priests, deacons, lay men and women, seminarians. There were hugs and handshakes, conversations about parish meetings, and genuine concerns expressed about the recent school closings. 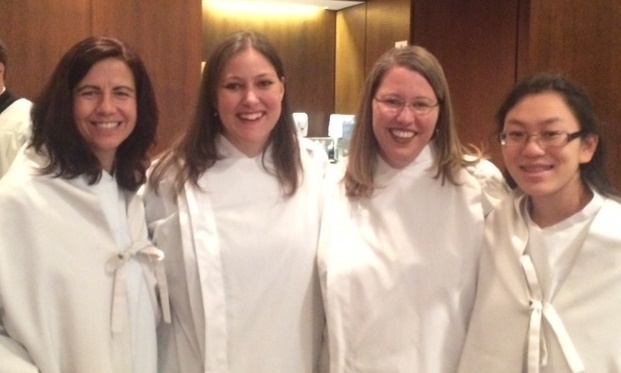 Women serving on the altar is not something you see every day – and certainly not at the installation of a bishop! If anyone objected to our presence, no one said it. Not with their words or their body language. As a matter of fact, I heard “thank you” a lot – thank you for being here, thank you for serving, thank you for all that you do. I heard this from priests and laypeople alike. After mass, I ran into a priest who I’ve met many times. He is a very faithful and capable priest, but his demeanor is rather … stiff. It is easy to mis-read his cues as unfriendly. When we passed each other in the sacristy, he exuded the warmest smile and most friendly greeting that we have ever exchanged! On this day, in particular, that one encounter meant a lot! This is a fabulous picture! I find it funny, because the high-def photography makes it appear as if Cardinal O’Malley is standing immediately behind us. He was easily 8-10 feet away! During the hand washing, I kept thinking about my Sacraments class and various lectures on liturgical symbols – symbols make real what they signify, so make sure they’re done well. I used a lot of water!! I also took a good, long look at Bishop Cupich’s hands. Hands carry a history, hands tell a story. My grandma had hands that were strong enough to carry a crate of calf bottles and knuckles big enough to knead bread dough. Bishop Cupich has hands that are soft yet well-worn with age and wisdom. Hands that have surely baptized babies and anointed the elderly. Hands that will touch a lot of lives here in Chicago. 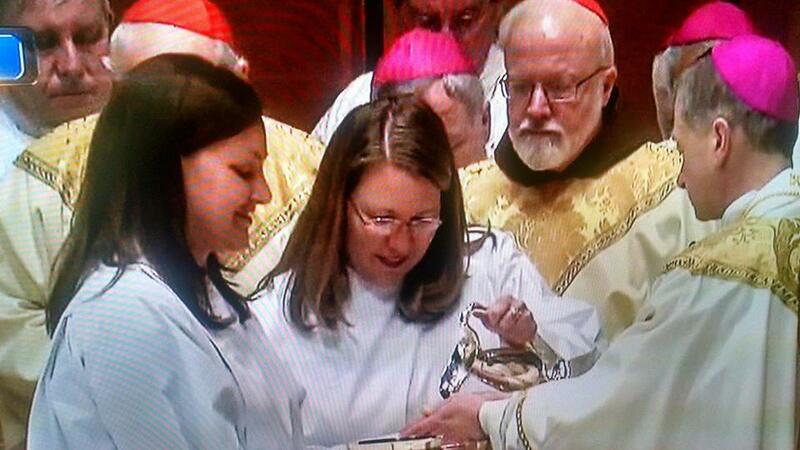 Christina and I also both noted how he looked us in the eye during the rite. He has these piercing blue eyes, set deep into his face – inviting people in and reading everything around him. Also during communion, one of our fellow altar servers, Juan Ramirez, sang every verse and refrain of the hymn Pescadores de Hombres without ever opening the worship aid. As I turned to look at him, I could see all the bishops seated behind us – not exactly the epitome of ethnic diversity. 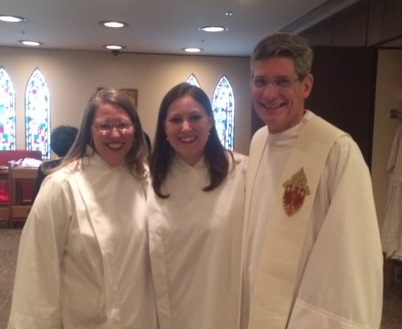 The liturgical ministers (readers, greeters, ushers, musicians) represented the breadth of the church of Chicago. Prayers of the Faithful were recited in English, Spanish, Vietnamese, Ojibway, Croation, Italian, and Tagalog. I enjoyed the shouts of “Vive!” in response to Bishop Cupich’s greetings in Spanish. It made me long for a day when our bishop’s conference is a wider representation of the people of God. Finally, what does all this mean? 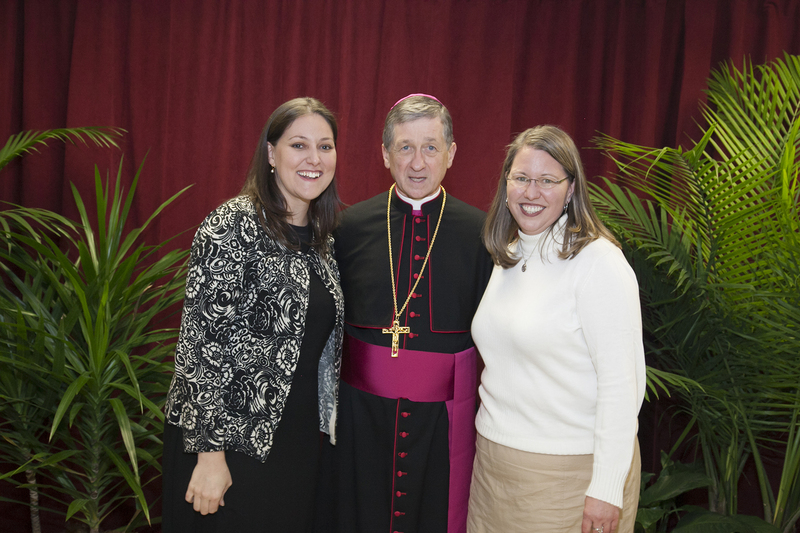 Christina and I meeting Bishop Cupich at the reception. I am sure there are people for whom this change in administration is more than a little nerve wracking. Change is always hard, and I’m sure those changes will be coming soon. It was great to be a part of the excitement and anticipation of something new. I’ve been through more transitions than I care to remember in recent years! I’ve seen how leaders set the tone for an organization. We pick up cues about what is acceptable, what is preferred. I see how young people mimic the work of their mentors, until they begin to find their own way. If this Installation Mass is any indication of what is to come, then what a great example for others to follow! If Bishop Cupich is serious about listening to the needs and concerns of women, then inviting women to serve at the table of the Lord is certainly a good place to start! What a joy to witness and participate in this new beginning.